We woke up very early this morning, before six, and Kate went over to the guest cabin to collect our bento box breakfast and lunch packs. 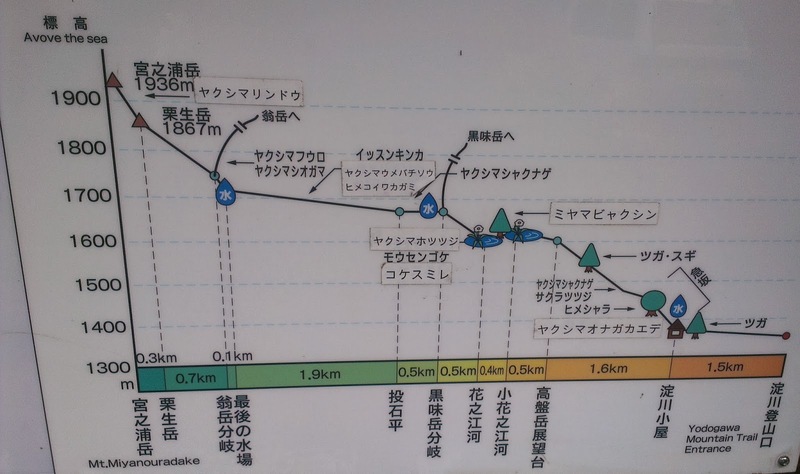 Today we planned to spend most of our time hiking the Yodogawa (淀川= eddy + river) trail of Yakushima and were hoping to go as far as Kuromi-dake (黒見岳 = black + see + peak), which is a 1831m mountain located about 5.3km from the start of the trail. The route is not as well-known as some of the others and we had chosen it since we didn’t have enough time to make it all the way to the 4-6000 year old Jōmon-sugi at the end of the Oakabu trail and back. It was our last day on Yakushima and we needed to make sure to catch the last hydrofoil which left from Miyanoura port at 17:10. We had two bento boxes each and were actually not able to work out which was lunch and which was breakfast. In the end we decided to eat the one with the most perishable items (egg, salmon, chicken) now for breakfast, and save the other one for Lunch. We didn’t have anything to keep the lunch box cold, but we stuck it in the freezer while we got ready to get it as cold as possible. As partially mentioned, our breakfast contained eggs, soy sauce, pickles, salmon, deep fried and tempura chicken in the upper half and the lower contained a stack of rice with a dried plum in the middle- also known as the Hiromaru (flag of Japan) bento. To our delight it was a beautiful clear day outside with hardly a cloud in sight! I checked the weather forecast to be sure and was happy to find that there was only a 10% chance of rain forecast for today! We had been told to drop our key into a box before leaving but although it was only 6:30am the manager was awake and we were able to give it directly to him. The Yodogawa Mountain Trail Entrance (淀川入口) is located at the end of the road that passes by Yakusugi land. Beyond Yakusugi Land but before reaching the trailhead we made sure to stop at the Kigensugi (紀元杉 = chronicle + beginning + cedar). This ancient cedar tree is the easiest to access on Yakushima as it’s located right on the side of the road. It also happens to be the oldest tree we’ve ever seen with an estimated age of over 3000 years! There was a short boardwalk that climbed down and around the tree so we could see it from all angles. Despite its age this tree is only around 20m tall and has a diameter of two and a half metres. It’s so amazing to think that this tree has been around for over three thousand years! When Kigensugi first starting growing the state of Sparta was first established and the ancient Japanese people had just begun to cultivate rice. Apart from the Yakusugi, we also saw the Stump of Momi, which was a 455 year old fir tree. Fir trees do not live as long as cedar trees and this one had reached an exceptional age for its species before dying and being cut down. Once we’d had a good look at both trees, we hopped back in the car and continued down to the trailhead, arriving at around 7:25am. Upon arriving, we found that the car park area was completely full (apart from a roped off area) and had to drive a far distance back down the road before we found somewhere we could pull over. After slogging our way back up the hill we saw some other people arrive and park in the roped off area! It turned out they were park rangers/workers, and after doing some maintenance to the small toilet next to the car park, they set off along the trail carrying some massive containers on their backs. Right at the start of the path we found a map and elevation chart as well as some hiking forms that we filled out before setting off. The elevation profile was focussed on the path to Mount Miyanoura, and our destination (Kuromi-dake) was listed as a detour. As we spent most of the time diligently walking there isn’t really too much to say. The path was well maintained, with wooden steps installed on the hilly section and plenty of signs. We hiked at a pretty fast pace and overtook quite a few people as we walked. Most of the other hikers were in groups of around 4-6 and had guides leading and explaining things. They were also all very well kitted out with big packs and rain gear. We didn’t have any rain gear at all apart from an umbrella each! Like Yakusugi Land, everything was very damp and the luscious vegetation coated in moss. As we were in the UNESCO World Heritage Area, there were signs about saying we had to make sure to respect the natural environment. Apart from those signs, there were also regular markers indicating how far we were from various destinations such as the trailhead and Mt. Miyanoura. Junctions were also well signed with these indicators. After about 1.5km and half an hour walking we reached the Yodogawa Hut. Facilities here included a basic wooden building that you could use to sleep in (though there is no bedding and I think it may have just been a floor), toilets and fresh water. They were pumping the contents of the toilet into the portable backpack containers. That has got to be one of the worse jobs in the world. You would not want those to leak or crack open on the way back. Anyway, it seemed a bit strange to us for the hut to be so close to the start of the trail. Why would you stop after only 1.5km? Or, why would you not just continue the extra little bit to the car park? Well, it turns out that the trail continues through the car park and actually leads all the way back down to the coast. So it makes sense if you’re hiking from one side of the island to the other. A little way past the hut we found a bridge leading over a nice river. It was still wonderful and sunny at this time and we stopped to take a few photos before continuing on to the Hana-no-ego marsh. The path to the hut was more or less flat for most of the way after which it was steep for a short distance before levelling out to a more moderate grade for the next couple of kilometres. As we neared the marsh it started to rain! What happened to our clear day and only 10% chance!! We had walked around 2.5km so far and decided to press on as it was only a fine mist at this stage and we had yet to reach the marsh or mountain. In an attempt to keep ourselves dry we pulled out our umbrellas while we passed a few more groups who were struggling into their raincoats and pants. The rain was on again off again, and it when it stopped, so would the groups to take off their rain coats! Once it started again, everyone was climbing back into them! Which was pretty funny. For us it was a bit difficult to walk along the narrow path with the umbrella though it was doing a good job keeping us dry. After 3.8km and 90 minutes we reached the Ko-Hana-no-ego (子花之江河) at around 9:20am. The rain had become pretty heavy by this stage, though not quite enough to get us too wet. The marsh was really pretty and had some low paths leading through to the other side. The precipitation actually added to the atmosphere and made everything look more serene and misty. Though this was hard to capture on camera. In real life it looked much prettier than these photos! The mash was split into two sections, and after the first one we walked another 400m up along a dry path to reach the second section. The Hana-no-ego (花之江河)) marsh was much bigger than the first, had more boardwalks and also served as a junction between five different trails. In addition there was a portable toilet pack drop off area where we saw a lady walking back from looking sheepish. We made sure to have a good look at the marsh and attempt to take lots of photos! I want to mention here that the map we had purchased yesterday had served us very well and we were impressed to find that the times in the map were spot on with how long it had taken us to walk the different sections. From the marshes we continued along towards Mt Miyanoura-dake until we reached the junction for Kuromi-dake about twenty minutes later. There wasn’t a lot of area at the junction however there were a few people stopped there resting or arranging their packs. Meanwhile, the rain had continued to get heavier and was starting to get to us both physically and mentally. While we stopped for a snack, an old Japanese man came up to us and asked us if we had Amagu (雨具= Rain gear). I indicated our umbrellas and he did not seem impressed, shaking his head and saying that the rest of the trail was a mountain path so we should not continue. I said we were not going that way (up to Miyanoura-dake) but were instead taking the Kuromi-dake detour. This calmed him down a bit though he still shook his head disapprovingly. Honestly, while the rain was wetting and depressing us it wasn’t like it was deadly. If we got stuck somewhere and it got cold overnight or something we might be in trouble though, I guess. Also at the junction there was some sort of antenna and sign talking about mobile reception, however we had none of course. The path up Mount Kuromi was quite difficult as the rain continued to increase and there were some steep tricky sections, some of which we needed to use chains to pull ourselves up. Not an easy feat with umbrellas. As we got higher and more exposed, the wind also increased and by the time we got near the top things had gotten pretty bad. The wet gale had soaked us with water and we could barely see more than a few metres in front of us. Although we were very close to the top of the 1831m tall mountain and had climbed up around 470m from the trailhead, we decided to head back down since we were miserable and even if we got to the top they’d be no view to enjoy anyway. Before climbing up I had hoped we’d be able to get above the clouds but this obviously wasn’t happening either. The climb back down was very slippery and tricky but we somehow managed it without major injuries. While the wind settled down at the bottom, the rain was just as heavy as we set off on an unhappy trudge back to the car park. We sure learnt our lesson today, if you are told to bring rain gear- bring proper rain gear!! The journey back seemed to take us much longer than the trip up and to my utter dismay the trudge eventually turned into a squelch when my waterproof shoes were finally breached. Kate’s had little sympathy as hers had already succumbed some time before. Thankfully, some zip-lock bags meant that we were at least able to save our electronics and important documents. Finally, after almost an age, we reached the hut under which we sheltered for a while with some other miserable looking people. Though they had rain gear at least! One of those people was a Caucasian girl who seemed to by herself and was the only westerner we saw on Yakushima. She spoke English and asked where we were going. We didn’t hang around under the hut for too long as we wanted to get back to the car park as soon as possible. We were wet, tired and hungry and quite looking forward to the packed lunches we’d left in the car. Along this last stretch the rain actually stopped which meant we could finally give our arms a rest from the umbrellas. Eventually, after two and a half long hours we made it back to the trail head and walked down to the car. In total we’d walked around ten kilometres and it was now 12:20am. Once we reached the car we used a lot of wet wipes to clean all the mud off ourselves and I desperately tried to salvage my shoes (They survived). All our dirty wet stuff got carefully chucked in the boot so we would not dirty the car. It was really welcome and we greatly enjoyed our packed bento which was still cool and delicious. The food was similar to breakfast though there were a few more fried items and everything was a little less perishable in general. There was also lots of rice to fill us up, and for desert I had a kitkat! After lunch we drove back down the mountains to the coast and as we descended we dropped out of the clouds wafting around the mountains. Even by the time we reached the bottom it was still only 1:40pm, so we decide to have a bit more of a look around the island. Nearby we found a volcanic lava field on a beach at the end of a short dirt road and stopped for a quick look. It’s part of the Tashiro coast of Yakushima and there was lots of lavary rocks! At this time we were still in our cold wet clothes and really wanted to go to one of the islands onsen to wash ourselves and warm up. Before that though, we drove over to Miyanoura Port so we could exchange our prepaid vouchers to secure seats on the Taneyaku Jetfoil back to Kagoshima. Tickets acquired, we drove back around to the Kusugawa Onsen, which was one of the closest and cheapest on the island. It was a small place with no other cars parked in the car park and looked a bit old, but not too bad so. We didn’t have any towels but upon asking I learnt that we could hire some for a small fee. After returning to the car to get a change of clothes and things ready some other people turned up and… how do I say? Uh… Well… Ok. They were pretty eh… not. Perhaps, rustic, very large and seemed somehow sort of quite dirty. Like this was a weeky bath. So Kate pulled the plug. We escaped and started hunting through our information for an alternate. While we wanted to try the beach ones the girls we spoke to yesterday had suggested, we had to decide that they were located too far away. Instead we settled on quite an expensive alternate called the Jomon no Yado Manten Onsen. It wasn’t located further away- another ten minutes. It might’ve actually been quicker to go to the ocean ones though as we had an awful time locating it. The maps we had were not great, there were no signs and it wasn’t where it really ought to have been. We drove round and around, eventually giving up and pulling into miscellaneous car park in despair. Kate went to explore the area on foot and somehow was able to locate the onsen nearby! 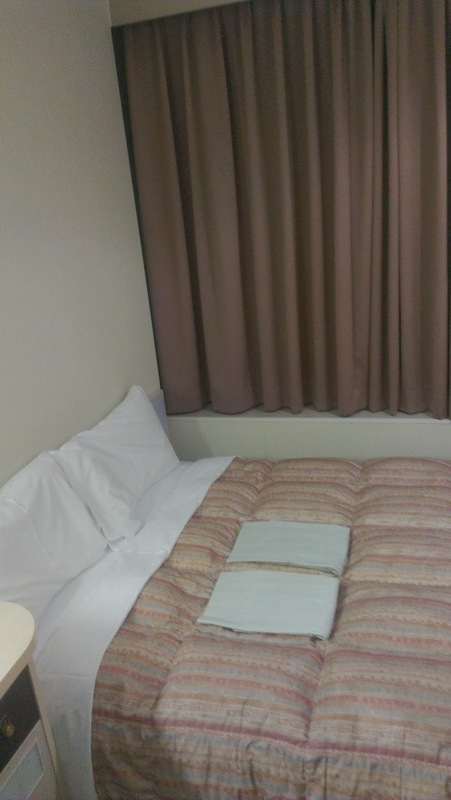 It was part of accommodation that you could stay at but we just paid for casual entry to the onsen. There was ample parking available and the many extras included with our entry included a towel, razors and toothbrushes. The inside was really nice and apart from the onsen there was also a relaxation zone. The onsen baths themselves had lots and lots of lockers, scales, a sauna, lotions and things as well as a couple of big baths. There was even an outside bath, though it was closed while we were there. After scrubbing off all the dirt under the hot shower I had a nice relaxing soak in the hot bath. It was pretty quiet, though after a while someone else did come in. The onsen was really refreshing and helped wash away some of the gloom we’d been inflicted with after this morning’s drenching. Upon meeting up back at the car we drove back around the island to the port and filled up the car with petrol. After that we headed back to drop off the car, making sure to stop at the supermarket we had visited yesterday to clean it out and buy some cheap croc-like shoes for Kate. Both of our boots were completely soaked though I at least had thongs- Kate had left hers in Kagoshima for reasons unknown. Our car passed the post rental inspection and we were offered a trip down to the port, which we gladly accepted. While waiting for the boat Kate bought an ice-cream and a cool T-Shirt that had a picture of Yakushima on the front. The hydrofoil ride back to the mainland was pretty uneventful and we arrived into a rainy Kagoshima at around at around ten past seven. We’d well and truly had enough of the rain today, so instead of trying to walk to the tram we caught our first Japanese Taxi to the station. There were a few of them waiting outside the terminal building and all I had to say was “Kagoshima-Chuo Eki Onegaishimasu” which means Kagoshima-Chuo Station please. The taxi was clean, the doors opened by themselves and the trip was a little expensive at about $15 for our 3.3km journey. It was well worth it however. After arriving back at the station we used some ATMs to withdraw money, collected our luggage from the lockers and then used our rail passes to reserve a Shinkansen to Fukuoka. We arrived at Fukuoka’s main Hakata station at around 9:30pm and walked across the road to our pre-booked Comfort Inn Hotel. 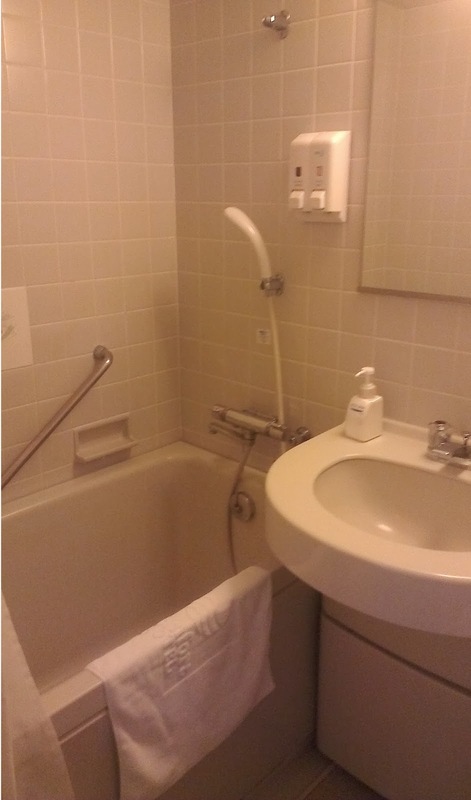 This is a pretty standard business hotel, though a little old. We’ve booked with this chain before and quite like them as they provide a good free breakfast, which we were looking forward to tomorrow! We had to hang up all our stinky wet stuff from today, and I spent quite a while duel wielding two hair dryers in a desperate attempt to dry my hiking boots. Once again, I have no idea what we ate for dinner! I think we probably just had snacks during our shinkansen journey. 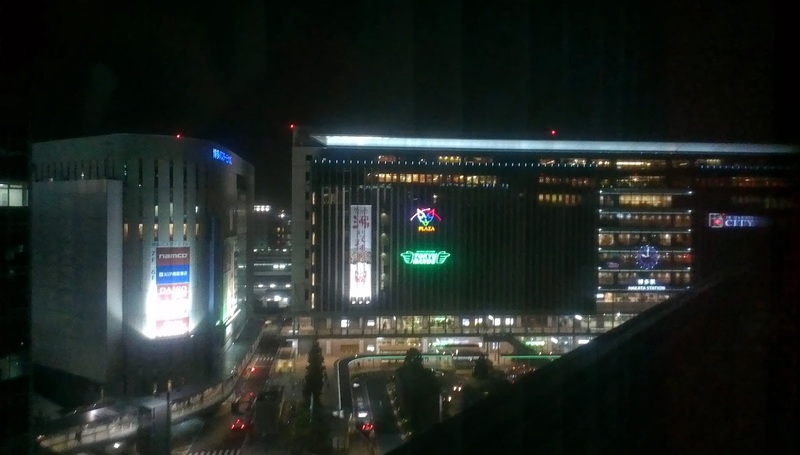 Fukuoka was just somewhere to sleep for tonight and this trip as tomorrow we’ll be leaving early to visit the Akiyoshidō caves located in Yamaguchi Prefecture. Are you considering visiting or have you recently travelled to Yakushima? Hi Eric, another great and very helpful post! It seems to me that you left your luggage in a locker at Kagoshima-Chuo Eki overnight. Do I get it right? I thought they would clear out the lockers at night. Any problems? I'm planning an overnight trip to Ibuzuki & the southern peninsula during my upcoming trip and I was going to ask the hotel if I could leave my luggage with them. Leaving them at the Kagoshima train station would save me some time upon return. Thanks for your help, Robin. Yep, that's exactly what we did, you can in fact leave your luggage in station lockers for three days and this something that people will often do. Generally you pay for the first day, then if you don't pick it up in time you have to pay again to open you locker when you come back. The limit is supposed to be three days as mentioned, though I did see a locker once that had >5700 yen owing! Only thing to watch is that sometimes lockers can get completely taken, especially the big ones as there are usually limited amounts of this size. About half way down the page for coin lockers! Thanks for taking the time to describe in so much detail. I'm planning my first trip to Japan, with a lot of time spent in the Ryukyus. Your blog is the most helpful resource I've found for Yakushima!